My coworker and I were talking about Halley’s Comet. It was last visible in March of 1986, when I was 10 & 11/12ths. He glared at me, because he’s like a decade older, then said something about Mark Twain being born and dying the same years as Halley’s Comet. I thought that was odd so I looked it up. Turns out it is true! Here’s what Wikipedia had to say: Mark Twain was born on 30 November 1835, exactly two weeks after the Halley’s Comet. In his autobiography, published in 1909, he said, “I came in with Halley’s Comet in 1835. It is coming again next year, and I expect to go out with it. It will be the greatest disappointment of my life if I don’t go out with Halley’s Comet. The Almighty has said, no doubt: ‘Now here are these two unaccountable freaks; they came in together, they must go out together.’” Twain died on 21 April 1910, the day following Halley’s Comet. Feel free to tuck this little random nugget away for conversation lulls. 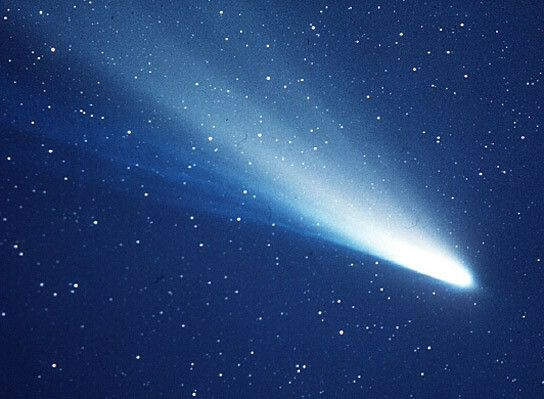 PS: If you are wondering, Halley’s Comet will visible again on 28 July 2061. Mark your calendars! By Jillbeingstill in Fun Fact Friday, Random on October 11, 2013 .